Motor neurone disease (MND) is a rare but debilitating and ultimately fatal neurodegenerative disorder. Currently there are no treatments that can stop the progression of the disease; one licensed treatment has been shown to extend survival, but by only a few months. We urgently need new and effective therapeutic approaches that can modify or halt disease progression and reverse the damage MND causes to the nervous system. How might stem cells help? Several different conditions caused by damage to nerve cells (neurons) controlling our muscles are collectively classified as Motor Neurone Disease (MND). Currently there is no cure for MND, so most treatments focus on relieving symptoms to improve individuals’ quality of life. Approximately 10% of MND cases are inherited from parents to children. The cause of most MND cases (90%) are not currently known. There are many cells in the brain that support neurons and help them function. Increasing evidence suggests that if these supporting cells become dysfunctional, motor neurons are susceptible to damage. Researchers are using stem cells to develop methods for growing neurons and other cells in a dish as a way to recreate (or ‘model’) MND. This greatly helps researchers study and discover the causes of neuron damage and what might prevent it. Stem cell model systems are also very useful for screening new drugs and testing the safety and effectiveness of new treatments. Stem cells are also being developed as treatments for individuals with MND. Stem cells may be able to help regulate harmful immune responses or even produce growth factors that help neurons survive and repair themselves. Researchers know relatively little about MND because of how complex and multi-faceted this condition is. This complexity also means that MND treatments must simultaneously rectify many changes in the body to be effective at stopping further damage to the nervous system. Repairing damage caused by MND will be an even greater challenge. Researchers are examining ways stem cells might be used to repair the nervous system by growing new neurons and supporting cells. To fully restore function, these new cells must also properly integrate into the network of cells that make up the nervous system. What causes MND and how is it treated? How could stem cells be used? Can human stem cells be used to treat MND now? MND comprises a group of conditions that affect cells within the nervous system, ultimately leading to the degeneration of cells that form motor pathways – the motor neurons. Motor pathways generate and control movement by relaying electrical signals from brain and spinal cord motor neurons to the muscles via synapses (connections) with peripheral motor neurons. Peripheral motor neurons relay signals from the brain to the muscle through a synapse called the neuromuscular junction (NMJ). In MND, motor neurons become diseased and die, leading to progressive paralysis (inability to move). There are four main types of MND, which variably affect central-nervous-system (CNS) and peripheral-nervous-system (PNS) motor pathways (otherwise known as ‘upper’ and ‘lower’ motor systems respectively). People with MND may thus experience a range of symptoms including (but not limited to) muscle weakness, muscle stiffness, and difficulties with speaking, swallowing and even breathing. Generally over time, the muscles begin to waste, making symptoms progressively worse. There is much clinical overlap among the various forms of MND, which makes it difficult to diagnose a specific type in many people affected by this condition. The most common form of adult-onset MND is amyotrophic lateral sclerosis (ALS), which affects both CNS and PNS pathways and accounts for approximately 60–70% of all cases. In the USA, ALS is generally known as ‘Lou Gehrig’s disease’ and affects about 7 in every 100,000 people. The following information in this fact-sheet relates mostly to ALS. We have used the term ‘MND’ throughout because this is how ALS is widely known in the UK. Some forms of MND are inherited or ‘familial’, which means they are passed on genetically from one generation to the next. Around 10% of MND falls into this category. The first ‘genetic’ form of MND was found to result from a mutation in the gene that codes for the enzyme superoxide dismutase 1 (SOD1). Clinically, people carrying this mutation present in a very similar way to those in whom no genetic or other cause has been identified (‘sporadic’ MND), suggesting shared mechanisms of disease progression. Since this discovery, many other MND-causing mutations, both in SOD1 and about a dozen other genes, have been identified, leading to a multitude of hypotheses about how the disease develops. Generally, inherited forms of neurodegenerative disease have an earlier disease onset, but sporadic cases of MND can arise in adults of any age. Interestingly, a very similar disorder to MND in dogs, known as canine degenerative myelopathy (CDM) largely results from mutations in SOD1. The dog may yet become a critical piece of the puzzle with which to understand mechanisms of MND and explore new treatments. This is because CDM develops naturally in this species and because dogs and humans are exposed to similar environmental and lifestyle factors. The vast majority of people with MND have a sporadic or non-inherited form of the disease, thought to be caused by a combination of genetic changes and an individual’s environment. The particular environmental factors responsible have not yet been proven. Scientists believe that motor pathways stop working not just because of changes within specific cells, but also because of damage to other supportive cell types in their immediate surroundings. There is increasing evidence that these other cells – the ‘glia’ - of the nervous system play critical roles in both health and disease. In the CNS, the main categories of glia comprise astrocytes, oligodendrocytes and microglia. These cells each have many different functions, only some of which are currently well understood; for example, the microglia function as the immune cells of the CNS, whilst the oligodendrocytes are responsible for producing the myelin sheath that wraps around neuronal axons, allowing fast conduction of electrical signals. In the PNS, the Schwann cell performs the role of the oligodendrocyte. The glia respond rapidly to neuronal injury, but their responses might not always be desirable. Equally, because of their supportive roles, dysfunctional glia may leave neurons and nerve cells vulnerable to injury. There is also evidence to suggest that the first signs of disease occur at the NMJ, where the motor neurons connect to the muscle. Degradation at the NMJ happens before the onset of symptoms, and spreads from the NMJ through the PNS and CNS. It is possible that early intervention at the NMJ could delay or prevent progressive degradation. To date there is no cure for any form of MND. Current therapeutic approaches focus on relieving symptoms or providing technological and functional aids to improve life quality (for example Speak:Unique, the Voicebank Research Project). The first and only available treatment licensed for use on the NHS that has been shown to alter the progression in some people with MND is the drug riluzole. Currently it is not known which of the many actions of riluzole provide beneficial effects in MND; irrespectively these effects are very limited, extending survival for merely 2 to 3 months. Scientists and clinicians are actively searching for more effective treatments. Scientific advances have led to enormous progress in MND research during the last decade, but so far we know relatively little about how and why motor pathways degenerate in MND. Many different factors seem to be involved in the onset and progression of this disease. Any effective therapeutic approach would need to address most, if not all, of the damaging changes that are happening in the body simultaneously. It is likely therefore, that a combination of treatments will be needed to halt or slow disease progression. A much tougher challenge will be to find treatments that can then repair the damaged nervous system and reverse disabling symptoms. Researchers are now using human stem cells to make models of MND “in a dish”, aiming to discover more about the cellular and molecular mechanisms that underlie MND. These model systems can be further be used to screen new treatments. They are also investigating whether these human stem cells could themselves be used therapeutically. There are several types of stem cell that offer different possibilities for research and therapies. The cells affected by MND are located in the nervous system, which is difficult to access. This means that MND is very challenging to study in affected individuals, and there is limited potential to obtain samples of damaged cells for closer examination in the laboratory. Initial efforts were focussed on using embryonic stem cells to study the disease. In 2008, a team of scientists at Harvard University in the USA used skin cells from a person with MND to tackle this problem. The researchers first transformed the skin cells into induced pluripotent stem cells (iPS cells)— iPS cells are cells that have been artificially reprogrammed to become pluripotent stem cells (cells that can make more of themselves and also any cell type in the body). The iPS cells were thus used to make motor neurons, presenting a new opportunity to use disease-relevant human cells for studying MND. Using a similar method, scientists at the University of Edinburgh generated motor neurons in the lab from an individual carrying an MND-causing gene mutation. These motor neurons died much faster than motor neurons generated from the skin of a healthy volunteer, thus mimicking MND in a dish. iPS cell-derived model systems provide a powerful tool to look at human cells in the context of disease, discover new mechanistic details of how the disease might progress, and examine how different cells of the nervous system influence each other. By generating glia from iPS cells and growing them both in isolation and together with motor neurons, researchers can start to tease out the roles of glia in MND and whether glia might be harnessed for therapy. Additionally, growing motor neurons together with muscle cells can produce a NMJ ‘in-a-dish’, allowing study of how neuron-muscle signals are disrupted, and potentially finding ways to enhance and preserve these signals in MND. Finally, an important advantage of iPS technology is that cells can be generated from people with different forms of MND in order to better understand the similarities and differences among these disorders, which are likely to require specific treatment regimes. Although yet to be demonstrated, iPS technology could be applied to investigate similar disorders in other species, for example CDM in dogs, potentially providing an ethically viable bridge for translating discoveries from the lab to the clinic. The ability to grow large numbers of stem-cell derived motor neurons and other disease-relevant cells in a dish enables scientists to screen thousands of drugs that could potentially treat MND. These may be entirely new drugs, or compounds that have already been licensed for use in humans for other disorders. In this way, ‘old drugs’ might be rapidly repurposed for MND, by fast-tracking them to later clinical research phases without the need for lengthy and expensive pre-clinical studies. iPS technology may also eventually open a gateway into ‘precision medicine’ for MND, whereby a bespoke treatment is devised for an individual, based on the way their cells respond to a particular treatment in the lab. 3. Using human stem cells as a therapy for MND? The possibility of using stem cell-derived neurons as a cell-replacement therapy to treat MND remains a huge conceptual, technical and ethical challenge. One reason is the complexity of circuits within the nervous system and the need for any replacement cells to form the correct functional interactions with the cells that remain. These complex circuits were originally developed and refined within an individual over many years to enable the fine control of movement, through ‘motor learning’. Any new cells would need to ‘learn’ how to play a meaningful part in the circuit without disrupting the goals of that circuit – as in any complicated network there is much potential for things to go wrong. As mentioned above, there are also many factors contributing to neurodegeneration in MND, including a potentially toxic cellular environment. Any transplanted cells, however healthy, may simply degenerate once exposed to these same factors. An alternative potential use for human stem cells in MND might be to transplant cells that can support the survival and function of remaining motor neurons and/or modify the environment to which they are exposed. In this way, scientists are hoping to protect motor pathways from further damage and extend their survival, which will in turn slow the clinical progression of MND. This idea is conceptually more practical, and several types of stem cells are being tested for this application. At present, the main utility of stem cells in the context of MND is in disease modelling. Transplantation of stem cells continues to be an avenue for future research; preliminary studies suggest that the procedure is safe and may even confer some benefit, although this remains to be confirmed in larger cohorts of people with MND. Clinical trials for MND face the many well-recognised challenges that apply to any condition with the additional ethical concerns of recruiting people who have a short life expectancy and are urgently seeking disease-modifying treatments. There are further concerns that established ‘gold standard’ clinical trial designs (including randomization of treatments to different groups, inclusion of double blinding and use of placebos) is simply not practical or ethical for some studies involving people with MND. This inherently diminishes confidence in the results of these trials. Current clinical trials are aiming to determine the best type of stem cells, delivery methods as well as effective and safe doses. It is important to note that although stem cell-based therapies show promise in animal models, there is insufficient evidence of any benefit for the treatment of MND. Mesenchymal stromal cells (MSCs) are adult stem cells that can be easily isolated from bone marrow and grown in the laboratory. MSCs are easy to derive in large numbers and release factors that can act to suppress the immune system. As such, they have been highlighted as potentially promising candidates for cell-based therapies in that they may help to regulate immune responses in people with MND. In addition, in the laboratory these stem cells can be turned into MSC-NTFs (MSCs secreting neurotrophic factors). These are more specialised cells that can produce growth factors that support the survival of neurons. In human trials, Phase I studies (Phase I is a clinical trial focussed on assessing the safety of a treatment) have shown that transplantation of MSCs into people with MND using various delivery methods (injections into the spinal cord or blood) has no major harmful consequences. In 2016, transplantation of MSC-NTF cells was trialled in a Phase II clinical trial (assessing whether a treatment has clinical benefit following the establishment of safety) by a US company called Brainstorm Cell Therapeutic, to assess its safety and efficacy in a larger group of people with MND. The trial showed that these types of stem cells are safe when injected into the arm and spinal cord and that disease progression was slowed in some patients (ClinicalTrials.gov NCT02017912). A larger Phase III clinical trial (testing the clinical efficacy of the treatment on a much larger group of patients) is now underway. (Clinicaltrials.gov NCT03280056). Neural stem cells (NSCs) are specialised stem cells that can give rise to all cell types of the nervous system. In the healthy brain, glia provide support to neurons and actively engage with neuronal functions. In people with MND, however, glial cells may lose these critical functions and even become detrimental to motor neurons. Transplanted NSCs offer the opportunity to modify the potentially damaging environment that motor neurons are living in. In laboratory studies, direct injection of NSCs into the spinal cords of MND rat models increased the survival of motor neurons at the transplantation sites. Early studies involving transplantation of NSCs into people with MND has been shown to be tolerated without major side effects. Some recipients reported slowed disease progression or clinical improvement (ClinicalTrials.gov NCT01348451). However, because of the small number of people enrolled in this Phase I, open-label safety study, these secondary positive outcomes must be interpreted with caution. A phase II trial is being carried out by a company called NeuralStem Inc. on 18 people with MND (ClinicalTrials.gov NCT01730716), confirming that transplantation of these cells is safe, but the benefit of such treatments is still being investigated. In addition to NSCs, glial restricted progenitor (GRP) cells and neural progenitor cells (NPCs) can also make glial cells after transplantation. In particular, NPCs have been engineered to stably produce a growth factor (glial cell line-derived neurotrophic factor, GDNF) to enhance their support of motor neurons. Transplantation of these two types of stem cells into MND rodent models resulted in increased survival of motor neurons, leading to improved movement and survival time. Transplantation of these stem cells is now in the early stages of Phase I clinical trials (ClinicalTrials.gov NCT02943850). testing the safety and tolerability of a new drug or treatment approach in a small number of healthy human volunteers to establish dose range and/or technique. These ‘first in human’ studies are sometimes directly performed in people with MND because the intervention is too invasive to test in healthy human volunteers. testing the biological efficacy, therapeutic effectiveness and safety of a drug or treatment approach in a large number of people with the condition of interest (the gold standard is a multi-centre, randomised, double-blinded, placebo-controlled trial). Typically a key outcome is to test whether the new treatment is more beneficial than existing treatments. Note that only around 1 in 5000 novel drug compounds eventually make it to FDA approval. The time taken to transition a new drug through the entire pipeline to the clinic is in the region of 12–18 years and the cost is in excess of a billion US dollars. amyotrophic lateral sclerosis (synonymous with ‘motor neurone disease’ and ‘Lou Gehrig’s disease’). the long, slender projection of a neuron or nerve cell that conducts electrical signals away from the cell body to a neighbouring neuron, nerve cell or effector organ/tissue e.g. muscle. in the context of clinical trial design, ‘blinding’ attempts to remove some sources of potential bias. A ‘single blinded’ study is one in which the participant does not know which treatment they are being given; in a ‘double blinded’ study both investigator and participant are unaware of which treatment is being administered. The most robust clinical trials are ‘double blinded’. Some MND clinical trials have been necessarily designed as ‘open label’ such that there is no blinding. canine degenerative myelopathy; a naturally occurring neurodegenerative disorder in dogs that demonstrates genetic, clinical and pathological overlap with some forms of human MND. central nervous system; a system of neurons and glia within the brain, brainstem and spinal cord that performs many roles including the coordination of peripheral nerve function. A motor neuron that synapses onto another motor neuron within the CNS or a peripheral motor nerve within the PNS is sometimes referred to as an ‘upper motor neuron’. synonymous with ‘inherited MND’; a form of MND with a defined genetic cause that can be passed from one generation to the next. a supportive cell type in the nervous system that has important functions in health and disease; plural ‘glia’. The main types of glia in the CNS are astrocytes, oligodendrocytes and microglia. glial restricted progenitor; a progenitor cell that can only differentiate into various types of glial cell. synonymous with ‘familial MND’; a form of MND with a defined genetic cause that can be passed from one generation to the next. a pluripotent stem cell artificially derived from a non-pluripotent cell (e.g. a skin cell) by cellular reprogramming - the forced expression of pluripotency genes. an electrically active cell that plays a role in controlling movement by activating muscle cells. motor neurone disease (synonymous with ‘amyotrophic lateral sclerosis and ‘Lou Gehrig’s disease’); a debilitating neurological condition that results in the degeneration of motor neurons in the brain and spinal cord leading to muscle weakness, loss of mobility, and difficulties with speech, swallowing and breathing. a multipotent stem cell has the ability to self-renew and differentiate into a restricted number of different cell types, e.g. neural stem cell. Progenitor or precursor cells are generally multipotent. in the context of genetics this means a change in the DNA that codes for a gene – a message that is translated into a protein. Some mutations are effectively innocuous and therefore do not cause disease; others can dramatically alter the structure and functioning of a protein or prevent it from being produced entirely, disrupting function and causing clinical consequences. myelin is the fatty sheath (produced by oligodendrocytes in the CNS and Schwann cells in the PNS) that wraps around neuronal axons. Myelin plays a role in supporting and protecting neuronal function and is critical for fast transmission of neuronal signals. progressive loss of structure or function of neurons and/or nerves, ultimately resulting in their death. a specialised cell that transmits electrical impulses within the central and peripheral nervous systems. There are different types of neurons, such as motor neurons or sensory neurons. The synapse between a peripheral motor neuron and a muscle, where the electrical impulses from the motor neuron are transmitted to the muscle to control movement. neural precursor cell; a multipotent cell that can replicate itself for a limited number of divisions and can also produce the various different cell types of the nervous system. An NPC is therefore more restricted than an NSC. neural stem cell; a multipotent cell type that can replicate itself indefinitely and produce all other cell types within the nervous system. neurotrophic factor; a biomolecule that supports the growth, survival, differentiation and maintenance of neurons. a glial cell type found in the CNS; its primary function is to produce the sheath of myelin that surrounds the axons of CNS neurons. clinical trial design in which neither investigator nor participant are blinded to the treatment being administered. Some MND trials are necessarily ‘open-label’. loss of ability to initiate or generate movement. a treatment control that aims to simulate an actual treatment in all respects except that it is biologically or medically inert. A control that aims to remove bias associated with the ‘placebo effect’ in which a person receiving an ineffectual treatment will have a perceived or actual improvement in their condition. a pluripotent cell has the capacity to differentiate into any cell type in the body. A pluripotent stem cell can also self-renew indefinitely. peripheral nervous system; a system of neurons and glia that transmit information outside of the brain and spinal cord and connect these regions electrically to peripheral tissues including muscle. A motor neuron that conducts signals from the brainstem or spinal cord to the muscle is sometimes referred to as a ‘lower motor neuron’. the customization of healthcare, tailored to the individual. in the context of clinical trial design, this refers to random assignment of people to different treatment groups including the group receiving a placebo or no treatment. An attempt to reduce selection bias. a glial cell type found in the PNS; its primary function is to produce the sheath of myelin that surrounds the axons of PNS neurons. the ability to replicate oneself. a form of MND in which no specific cause has been identified. superoxide dismutase 1; an anti-oxidant enzyme. Mutations in the gene coding for SOD1 are responsible for a small proportion of familial MND. a junction between two electrically active cells. This factsheet was created by Christine Weber. Reviewed in 2012 by Siddharthan Chandran and Rebecca Devon. Reviewed and updated in 2015 by Chen Zhao and Nina Rzechorzek. Reviewed in 2016 by Rebecca Devon, Belinda Cupid and Laura Stephenson. Reviewed and updated in 2018 by Claire Hetherington. Lead image of human neural stem cells courtesy of the Anne Rowling Regenerative Neurology Clinic. 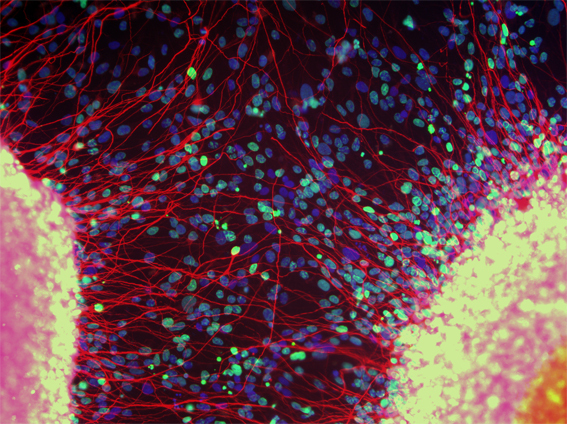 Picture of motor neurons made from iPS cells by Gist Croft and Mackenzie Weygandt and winner of the 2009 Olympus BioScapes Digital Imaging Competition®. Lou Gehrig, a successful baseball player in the 1920s and 30s, retired when he was 36 as the result of ALS. These motor neurons are made from iPS cells generated from ALS patients. Image courtesy of Gist Croft and Mackenzie Amoroso, Project A.L.S. Stephen Hawking, world-renowned theoretical physicist and author of the book A Brief History of Time, was diagnosed with motor neurone disease aged 21.